For every woman, her wedding is usually one of the most special days of her whole life. This is one day most women dream of and even go as far as planning even long before the find the Mr right. This day is usually accompanied with lots of things to get done, one of which is having the perfect wedding makeup done. For most ladies, this is left to a makeup buff. However, if there’s not a lot of money to spend, you can choose to do the makeup by yourself. It might be challenging, especially if you’ve not been into it before. However, with the few quick tips I intend to show you in this article, doing your own makeup will not be a problem. On the day of your wedding, you should prep your facial skin by washing and applying a light moisturizer. You may want to exfoliate; but make sure to use a gentle exfoliating cleanser. In the case of having any form of blemish, dab a little bit of Vision onto it. All of this is to make sure your palette is in tip-top condition – clean and soft, and ready for the main deal. Often times, people think applying foundation is to come before the primer – that is absolutely wrong. To achieve an ultra flawless look and beauty, it is important to begin your makeup with a primer, applied all over your face. This helps to even out skin texture and ensuring that your foundation to lasts long – at least for the day. Every application of foundation should be accompanied by an application of a concealer. While a foundation is designed for evening out the tone of the skin, concealers are for hiding things such as blemishes, dark circles and so on, under the eyes. Ensure that they come after the foundation is applied. In the case of a wedding, most likely, your gown is going to be white. As such, the colors involved in your makeup must compliment it. This also implies that your mix of colors should compensate for your gown’s lack of color. Not to forget your style of hair! These three aspects (makeup, hair and dress) must compliment one another. If there’s one thing you must remember, its knowing that your wedding day is nothing compared to your night outs. They are both on a different level with different requirement. Some ladies make the mistake of applying to many layers of foundation (and overly dark for that matter), too smoky eyes, blindingly bright lipstick and so on. You definitely will hate it when you see what a photo captures of you at the end of the day. It is important that you are guided by your skin tone and undertone when deciding on your choice of color for makeup. There are various colors that are a perfect match for specific skin types and complexions. Also to note is that your skin undertones should be considered when choosing your makeup colors. 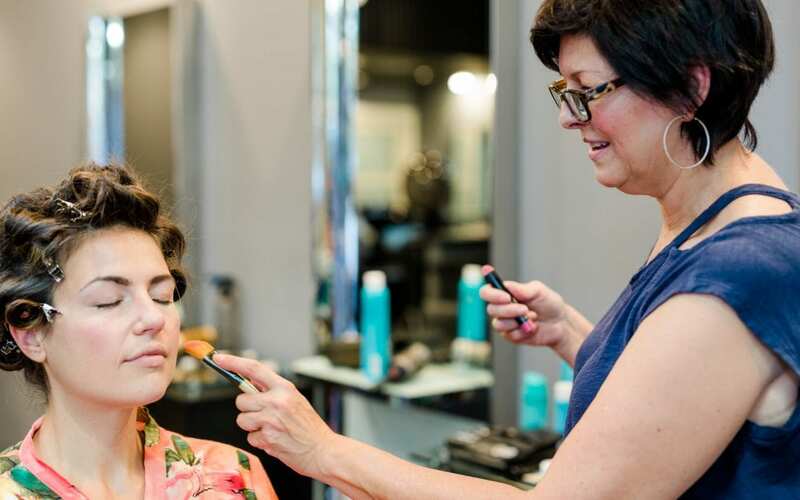 To ensure that you achieve a perfect makeup application, it is important that it is done in a calm environment. It may be difficult, but you will need to avoid distractions as much as possible. The more relaxed you are, the better the results out will get. Makeup is a skill and like any skill, it is going to involve a lot of practice. Even the makeup savvies don’t wait until the wedding day before the try out the makeup they intend to use for their wedding. You can’t afford that either. Start now to practice making up the look you desire. After which you can now document your combinations and process and keep for the main day.